Special ADI American standard keypads for rugged use. Dual Operation Mode â€“ Card Or Passcode. Superior painting ensures rust free body for many years. Onscreen Audit trials with upto 100 records can be viewed. Master code provided for Management access. Amiq Enterprises Establish 2005 It is a certified organization focuses on giving technology to empower today’s Customers and still making them afford technology. Our Strategy has always remained that, make technology Usable and Affordable, to make it popular and purposeful. 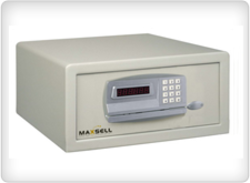 With our focus on quality electronics primarily, Amiq has built its product profile consistently like Cash counting machine, Currency detector, Electronic safe locker, paper shredders. Technology and innovation never stops, We have always kept our pace of making technology handy.